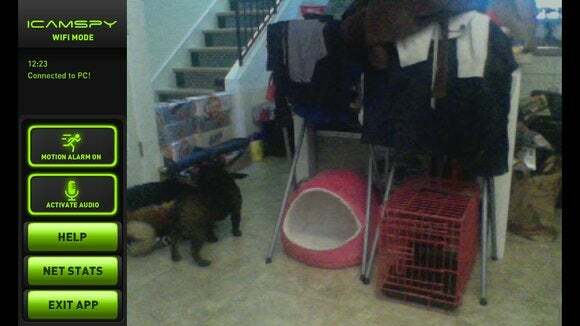 Home surveillance: It’s one of those things you probably don’t think about until you have to, like when you leave town for several weeks, or when you adopt a curious puppy who likes to put everything in his mouth. Or worst of all, after you’re the victim of a home break-in. Luckily, there are plenty of video surveillance options available, even if you’re on a budget or if you can’t mount high-tech cameras in your rented apartment. 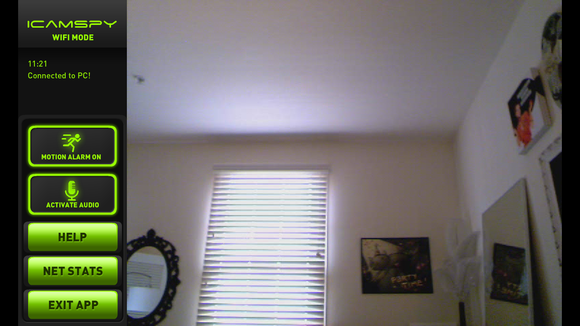 For example, you can set up a webcam to do your monitoring for you via Cloudcam. Or you can pick up a cloud camera (like Dropcam Pro) for high-definition, low-light monitoring. But even those options sound like a lot of work. The easiest, no-frills way to keep a watchful eye is to use an app on your phone paired with an extra piece of equipment. You’ll find tons of surveillance apps, video monitors, baby- and pet-cams, and other spy-type apps in the app marketplace that you can use to keep tabs on your pad-slash-baby-slash-pet. But not all of these apps are worth paying for, and many require extra set up—such as disabling firewalls and downloading extra programs—on your part. I tested several apps and found just two that are excellent at what they do and super easy to set up. Got an old iOS device lying around? Presence (free; iOS) can turn it into a Wi-Fi or cellular network-powered live streaming video feed that you can view remotely. Presence isn’t just a video camera app, though—it has surveillance features, such as motion detection alerts (you can set Presence to alert you when the streaming device picks up motion) and two-way video and audio capabilities. To use Presence, you’ll need two iOS devices running iOS 5.0 or later: One device to be the camera, and one device to be the monitor. Presence has a web portal as well, but it has limited capabilities: It can’t view live streams and can only see videos recorded after the app detects motion (if motion detect is enabled). Presence has a few customizable settings to give you the level of security you want. Getting started with Presence is ridiculously simple: Just download and install the app on both devices, set up an account, and give it permission to access your device’s camera. Each device can be used interchangeably as a camera or monitor, and you can connect as many devices as you like to your account. To start streaming video, just point your camera device at the area you’d like to monitor (People Power suggests purchasing a flexible stand, but you could also MacGyver a makeshift stand if you must), and tap “Use me as a video camera” on the app’s main screen. 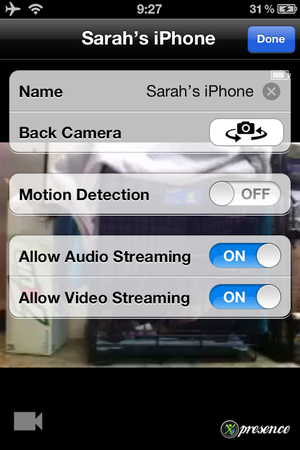 In streaming mode, you’ll be able to adjust various options, such as renaming the device, turning on motion detection, switching which of the iPhone’s two cameras to use, and toggle audio streaming, video streaming, and remote control on or off. You can also dim the screen to help save battery life, though you should probably keep your camera device plugged in if you’re going to be streaming for a while. To view your live stream on the monitor device, open up the Presence app and tap the camera device’s name under the “Remote Cameras” section. The app may take a moment to connect (or it may take a couple of tries), but it should eventually display a view of the live stream if both ends have a decent connection. The stream isn't great, but I can tell that Blanka is sound asleep in his crate. The stream isn’t perfect—it’s choppy and full of blocky-looking artifacts when there’s movement on the other side—but it’s better than a non-HD webcam, and perfectly acceptable for basic home surveillance. Audio streaming is clear and crisp, though it can have a lag of up to two seconds. From the monitor device, you can start a two-way video/audio conversation with the video device. This works well as a two-way baby or pet monitor (or, I suppose, as a way to scare off intruders from your home), but it’s not quite smooth enough for a lengthy video chat. You can also remotely control the video device via the monitor device, which means you can switch cameras and toggle video, audio, and motion detection on or off. Although its video capabilities could use a little work, Presence’s features make it one of the best free home surveillance apps on the market. The main drawback is that you need two iOS devices to use the app’s live streaming feature, and not everyone has an extra iPhone lying around. Luckily, the app works well with older iOS devices, including the iPhone 3GS, the iPad 2, and the fourth-generation iPod touch. 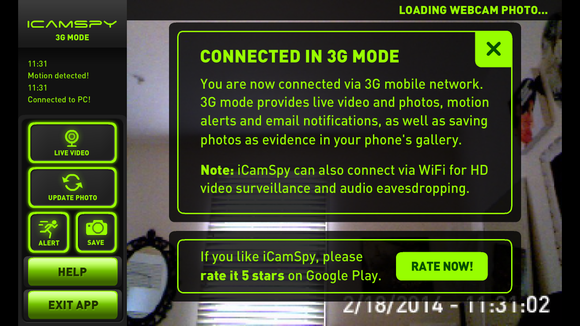 iCamSpy ($4; Android and PC/Mac) is a little different from Presence: Instead of using two mobile devices, it requires an Android device for monitoring and a PC with a webcam and microphone for surveillance. iCamSpy isn’t free, but its polished interface and excellent video capabilities make it worth the $4. Once you’ve downloaded and installed the app on your Android device, registering is a snap (all you need is an email address and a password). Setting up your PC is even easier: Just login to the Recorder Web Tool at iCamSpy.com. Allow the app to access your webcam and microphone, and it’ll start live streaming video and audio to your Android device. Set up your computer's webcam to record the area you want to monitor. Keep in mind that iCamSpy is a surveillance app, not a baby monitor. It doesn’t have the same two-way features as Presence, so you can’t communicate with your child, dog, or burglar-friend while you’re watching them via live stream. However, it has a motion detection feature, which recognizes motion in front of the camera and sends a sound alert to your phone. You can also opt to receive email motion alerts, and you can set the motion sensitivity to low, medium, or high. 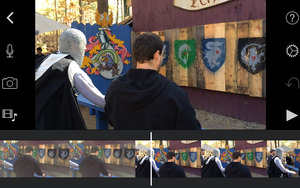 For long-term monitoring, the app records five-second video clips whenever it detects motion. This way, you don’t have to be constantly watching the stream to catch any action. 3G streaming isn't as reliable as Wi-Fi. In Wi-Fi mode, iCamSpy’s video is very good – smooth and practically HD (depending on your surveillance cam), with just a little choppiness. 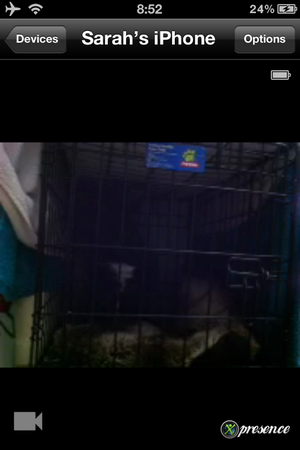 In 3G-mode, video lags and has artifacts, but it’s not much worse than Presence’s video quality. In Wi-Fi mode you can also monitor audio (turned off by default), check the network status, and toggle motion detection on and off. iCamSpy is a gorgeous, simple app that makes home surveillance a cinch. Its main weakness is that it’s not quite as portable as Presence, since it requires a PC and it works best with Wi-Fi on both ends. It can only track one surveillance camera at a time, while Presence can track multiple devices that are streaming simultaneously. Presence and iCamSpy are not the only video monitoring apps on the market, but they’re great for people who need a quick, easy solution to home surveillance. Both apps are easy to set up, easy to use, and have useful features like motion detection and audio monitoring. Thanks to both of these apps, I can now watch my French bulldog sleep, get up to drink water, and then go back to sleep for five hours while I’m working in another room.